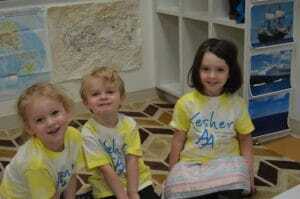 Kesher@AA is the religious education initiative for children grades Pre-K (age 3)-7th grade. We use the Chai curriculum, which focuses on three areas: Torah, Avodah, and G’milut Chasadim. Avodah is the introspective work we do to find sacred connections to God, community, and self. Engaging in the work of avodah can bring order, beauty, meaning and insight to our lives and our community. G’milut chasadim is our way of being personally responsible for making the world a better and holier place. Each week, we encourage our students to see past what they ‘think’ Judaism should be, and try to create a Judaism that is truly theirs. This comes through enriching text study, authentic Jewish experiences, and engagement with Hebrew language. Children who are a part of Kesher@AA are placed into age-appropriate k’futzot (Hebrew for groups). Each k’futzah is guided by a dynamic and passionate educator along with one madrich (teen counselor) as part of the group. Our madrichim serve as role models for continued Jewish learning and assist our educators in small group activities. Each k’futzah will explore the three areas of focus within the Chai curriculum: Torah, Avodah, and G’milut Chasadim. Our Judaics program uses a spiral curriculum. For more information on what each k’futzah studies, please refer to the Learning By K’futzah tab. Hebrew is more than something to learn for one’s Bar or Bat Mitzvah, it is the key to a deeper Jewish existence which opens the door to a world of experiences. We seek to develop comfort with the Hebrew language through songs, movement and a spiral curriculum that molds to each child’s skill level. Our program includes decoding, comprehension and fluency. Our 6th grade class focuses on trope training in preparation for Bar or Bat Mitzvah. Decoding: The first step in accessing a language is the ability to identify the letters and recognize their sounds. We incorporate both contemporary Jewish texts such as poems, stories and newspaper articles along with t’filot (prayers) and traditional Jewish text. Comprehension: We develop a student’s comprehension with our Hebrew Through Movement curriculum along with the ability to recognize shorashim (root letters). With this skill, students will be able to expand their personal Hebrew vocabulary. Fluency: Hebrew fluency is the ability to quickly identify, pronounce and comprehend commonly used shorashim within a body of text. With this skill, students will comfortably participate in every cultural and ritual aspect of Jewish life. Each week we conclude our day together with a camp inspired tefilah including prayers, Jewish and Hebrew songs and movement. This is an opportunity to bring our voices together and create a prayerful and mindful kehilah kedosha (holy community). Each child’s connection to Judaism manifests in different ways. Our Judaics curriculum is enhanced by chuggim (enrichment courses), which will allow students to explore different paths that will enrich their Jewish identity. Each k’futzah with experience a different chug each week. Chuggim include art, music, Israel and cooking. Gan means garden and is a place where our littlest sprouts grow their roots and begin their Jewish learning experience. In this k’futzah, through creative learning methods and the natural inquisitiveness and exploration of children, we develop a sense of Ahavat Yisrael. Ahavat Yisrael encompasses a love for the people and traditions of Israel. In this k’futzah, we focus on developing the foundation each Jewish person needs to live a fruitful Jewish life. These building blocks include stories from the book of Genesis (Bereshit), the study of Jewish holidays and sacred time, and performing acts of chesed (kindness). Additionally, these students learn about what makes a synagogue a special place, an integral part of Jewish learning, and a home for our community. In this k’futzah, we teach students to have ownership and pride in being a Jewish person and how to create a more holy world. This means not only looking out for those within our community and who are similar to us, but for all humanity and for all people in need. Students learn the laws and rules found in the Torah that help us to live a life filled with holy moments, Jewish stories, celebrations and rituals that help them understand and express their relationship with God. The Land of Israel and the Torah are two central pillars that have sustained Jewish existence for 2,000 years. We dedicate these two years to uncovering the roles they play in Jewish culture. One key question guiding this k’futzah’s learning is how we engage with a collective history and how we bring that history into our everyday lives. At its core, Judaism is about relationships. How we relate to others, to God, to our planet, and most importantly to ourselves. The main focus of these two years is the act of introspection, along with evaluating how we engage with the ‘others’ in our lives. An interaction that we gloss over quickly could have a lasting impression on the person we are with, so our students will uncover the values that guide the way we interact with each other, and how we give a sense of purpose to their relationships as they move into young adulthood. Teens in 9th-12th grades are eligible to participate in our Madrichim (counselor) program where they serve as group assistants in an assigned k’futzah Madrichim will receive community service hours and earn money towards scholarships for Jewish programming (youth group programs, Israel trips, summer camp, etc.). Madrichim are strongly encouraged to participate in TAAglit or AAtid. Eighth graders who wish to be in the madrichim program in the future, can enroll in our Madrichim in Training (MIT) program. Torah – Shemot (Exodus): The Torah teaches me how to be part of the Jewish people. Avodah- Intro to Prayer (talking to God): Jewish stories, celebrations and rituals help me understand and express my relationship with God. Gemilut Chasadim – Taking Action: We make the world a better place by performing acts of g’milut chasadim in our everyday lives. Torah – Vayikra (Leviticus): The laws and rules found in the Torah can help us to live a life filled with holy moments. Avodah – Siddur Literacy: Keva and kavanah, the fixed order of worship and the personal intention we bring to prayer, are complementary aspects of Jewish worship, combining to help us make sacred connections. Gemilut Chasadim – Small Acts, Big Differences: We have a responsibility to perform acts of g’milut chasadim for the people we encounter in our daily lives. Torah – Neviim (Prophets): The prophets were focused on reminding the Jewish people how God wants us to live. Avodah – T’filah: The practice of prayer can help me grow through personal reflection, can increase my connection to the Jewish people, and can strengthen my relationship with God. Gemilut Chasadim – Kol Yisrael Aravim Zeh B’zeh: We are all part of K’lal Yisrael and have a responsibility to actively support and sustain the Jewish community through acts of g’milut chasadim. Torah- Finding Our Voice: Studying Jewish texts allows us to explore our relationship with God and reflect on the ways God is continuously revealed to others and to ourselves. Avodah- Meeting God: A primary goal of this years work will be to help the students to understand the Revelation – God’s interaction with us as individuals and a community – is ongoing. Gemilut Chasadim- Me and My World: We can experience God in our world, in others and within ourselves by engaging in acts of g’milut chasadim. Torah- Subversive Torah: My life is reflected in and reflects Torah. Avodah- Mindful Presence: This level will enable students to say, “Hineini” (Here I am). By taking an in depth look at Jewish holidays and rituals, students will leave this year with their Jewish identity affirmed and reinforced. Gemilut Chasadim- Adolescent Evolution: Our development as emerging Jewish adults and authentic members of the Jewish community is closely linked to our ethical behavior (middot) and the performance of acts of g’milut chasadim.